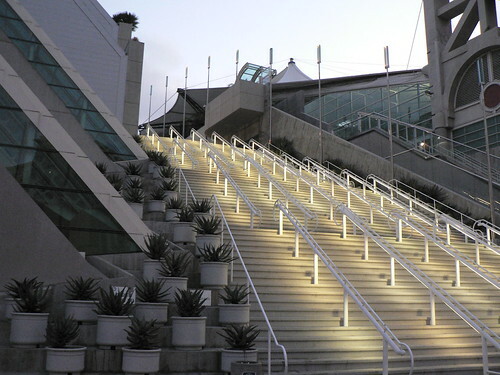 San Diego Convention Center Stairs, a photo by Marc_Smith on Flickr. Earlier this evening I let my husband talk me in to running the stairs at the San Diego Convention Center for 30 minutes. Yes, you read that correctly. I willingly ran stairs- 2,200 of them to be exact. It was grueling- and pleasantly empowering, and even a little cathartic once I found my rhythm- but mostly grueling. I'd like to say I did it for my health, but to be honest, I was procrastinating. The thought of going home after work to play catch-up on two weeks worth of blog posts actually sounded less appealing than inducing intense pain in my thighs. If you follow my little blog, you probably think I've fallen off the wagon. I assure you I'm not about to let that happen with mere weeks left of my 365 project. I've been busy creating summer tutoring curriculum, trying out new recipes for the Mr.'s new health kick, and scrawling my creative musings on random bits of paper. My creative life seems to be in draft mode again, so I haven't been sharing in a timely manner. I've become a bit (O.K., a lot) overwhelmed with all the creative quandaries occupying my mind, and I'm finding it incredibly hard to focus and see things through to completion. thousands of baby steps, deep breaths, self pep talks at the bottom of steep inclines, overcoming overwhelm, proving to myself that I can do it...and praying like hell that I won't trip and fall flat on my face. Leave it to a perfectly timed metaphor to bring me back to my sharing place. It is highly likely that I won't be able to walk for the next couple days, so I'll be here on my couch, finishing drafts of past posts, attempting to put the pieces together in a happy linear way. On the other side of overwhelm there is peace and clarity. I just have to get up that next set of stairs.